Meathead Movers is here to take care of the heavy lifting for you on your move to Hollister. Our clean-cut student athlete movers are ready to get you safely settled into your new Hollister home. Welcome to Meathead Movers of Hollister! If you are moving to or from anywhere in Hollister, we are the moving company for you! Our professionally trained student-athlete movers and our moving concierge service are here to help you with every stage of your move in Hollister. Hollister is a beautiful town in Central California that is surrounded by sprawling hills and fertile land. Located in San Benito County, Hollister is just 40 minutes from the Monterey Peninsula and less than an hour from San Jose. The city is also a great place for those who love the outdoors. With Pinnacles National Park, and a breathtaking countryside, Hollister is a great place for the avid hiker or biker. 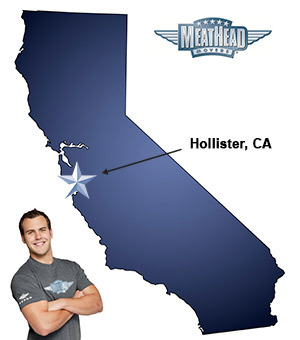 If you are considering making Hollister your new home, Meathead Movers is here to help. Our moving company specializes in local, long-distance, and commercial moves to, from, and within Hollister. We also provide reliable packing, storage, on-site relocations, and our distinctive moving concierge service. All our student-athlete movers are thoroughly screened and trained before their very first move. With branches not just in Hollister, but all throughout California, we are your one stop resource for all your moving needs, no matter where your California move takes you. In fact, you can see what your neighbors in Hollister have to say about us! With our 100% satisfaction guarantee, the only thing you have to lose is the stress that comes from moving! So contact us today for a free moving quote and to learn how we can help you on your next move! On time, friendly, hard working. Took great care with all my belongings especially a large lamp I couldn't box. Not one thing was broken or damaged. I have used movers 3 times in past with horrible results including dropping things from truck, breaking things, not to mention losing large items. This move was perfect and stress free from start to finish. Your movers were right on time extremely friendly and very motivated to get the job done in a very professional manner. I really appreciated this from these 3 gentleman! 1. You offer a premium service, but there is a premium price to pay. Overall, I think the service was over priced. 2. The movers were great, but they are not the best packers. I have unpacked about half the boxes and there have been some minor problems. I hope there are no further problems as I unpack the other boxes. I can see why you went to using Princess Packers. Your moving service was the best service I have ever used, and your employees were so nice, they made our move easy and as unstressful as possible. The three young men that you sent to do our move were so very nice, helpful, and kind. They did their job very well.